Archiving and compression is a great way to store and prepare files for sending. You can reduce the size of a file, turn a group of files into a single file, and even encrypt and password the contents! Just take a look at this image to see how much it compressed a 28GB text file. That's 28GB turned into 78MB! The only set-back can be the dreaded moment that you actually lose an archive password, which I'm sure we all have done. That's why this Null Byte is here to help you solve such a problem. A locked .zip or .rar file. A Linux live CD, or Cygwin, or Linux installation, or a Virtual Machine running Linux. An installed copy of rarcrack or fcrackzip. RarCrack and fcrackzip are the tools we are going to use to crack the archive. I picked both because fcrackzip is faster at cracking .zip files, but RarCrack is better at the others. For the actual task of cracking the archive, I will demonstrate how it is done via a vTutorial. Commands and description are below. Then just wait for your archives' passwords to be cracked! Come join the IRC sometime to talk with me one-on-one! So is this a brute force attack basically? I imagine longer passwords can take a long time. 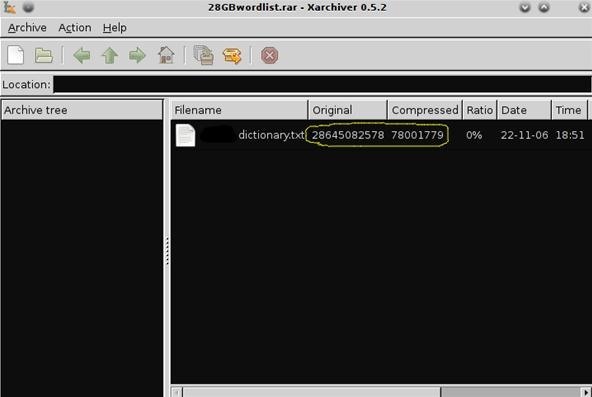 Also, ZIP archives that are a bit older are vulnerable to text-based attacked. You can use an algorithm to actually figure out the password if you know a word or two from a text file stored in the archive. There was a weakness in the way ZIP files validated passwords. Really its good but it is not easy to recover password from any zip file, try some thing new like Kernel for Zip recovery tool to repair and recover Zip files and also recover password security without losing any data. What if you know part of the password. Is it possible to include that in the command to reduce the time for cracking? ex: if the password is 'a25' and if you know the first letter is 'a', then put a in front. file is 35 kB small (is it complete? ), re-download not helped.